I’m just getting to the end of the first draft of (working title) The Soul Catcher. Set in early medieval Yorkshire (7th century) I’m finding I need to do much more research than for my previous novel The Weave. It’s not so much the big picture stuff I’m searching for but the little details that bring a touch of reality. Details about dress, weaponry and what it could/couldn’t do, pagan and christian rites and rituals. I read and I trawl the internet but recently I remembered an old favourite programme of mine Time Team. For those of you who may not know it – the programmes were hosted by Tony Robinson and he and a team of archeology experts undertook a 3-day dig on a whole variety of sites from different periods in history. I’ve been spending an hour most evenings indulging in armchair research going through any of the programmes relating to the Saxons. Apart from the enduring appeal of Tony Robinson and of the experts, the programmes are a treasure trove for an historical writer. In The Soul Catcher, one of the characters has a brooch which has a significant part to play and there on a Time Team dig they found just what I needed. What it was made of, where it was worn and so on. More importantly after it was cleaned up I could really see how beautiful it was and could tailor my own description. Living in France on a writer’s income (Ha!) it’s not very easy for me just to pop over to the British Museum and take a gander at the goodies there so the programmes have become a valued resource for me. I’ve learned about eel traps or hives (again a feature in the story) and about details of funeral rites and the making of swords at that time. Of course I’m not writing a factual history book so it’s important to be careful to get the balance right and not swamp the story and the characters with historical minutiae but because there is always a fantasy or supernatural element in what I write I hope I’m avoiding that trap. So in a couple of weeks time, after I’ve finished the first draft I’ll be able to start the editing process armed with a little notebook with all sorts of eclectic snippets that I may want to introduce to bring my hot-headed hero Wulfric and his life alive for the reader. Now back to Time Team! My first novel The Weave came out in paperback this week on Amazon and I’m eagerly waiting my copies of it. The Kindle version sold OK but I have this mental glitch that it’s not a ‘proper’ book unless it’s in paperback so I have used some of the Kindle sales to fund the paperback. All that remains now is to boost publicity for it which I really don’t like doing but know it’s a ‘must’. Where to begin? I’m using my social media as one prong of attack; have invested a very little in some paid-for promotion as a second prong and the third has been to take advantage of some very generous bloggers who will feature the book. A final thrust, when my copies arrive, is to have them on sale in our local cafe/bar (the village attracts a fair few English-speaking visitors) and the big supermarket Leclerc is also going to take copies on sale or return. I keep being asked whether I will have it translated into French and have looked at the possibility but as yet I have not decided. Financially it would be an investment that I can’t quite rise to…as yet. I’ll see how English sales go. where you can purchase the book. Happy reading. Happy New Year to everyone and I hope it will be all that you hope. After lying dormant for most of the festivities I had a belated present from a most unexpected source. Yesterday I was doing some housekeeping on this blog site when I noticed that the day’s statistics on viewing numbers were shooting through the roof. As I squinted at the numbers going upwards all the time I tried to figure out what was happening. In one day I received as many views as I have in some years! Finally I noticed a “pingback” message. Basically a pingback tells you that another site has inserted a link that comes to a post on my blog. Intrigued I checked it out. It was in The Guardian. There were just two words “Ravenser Odd” and, given the subject matter of the article – flooding and sea defences – the puzzle was solved. 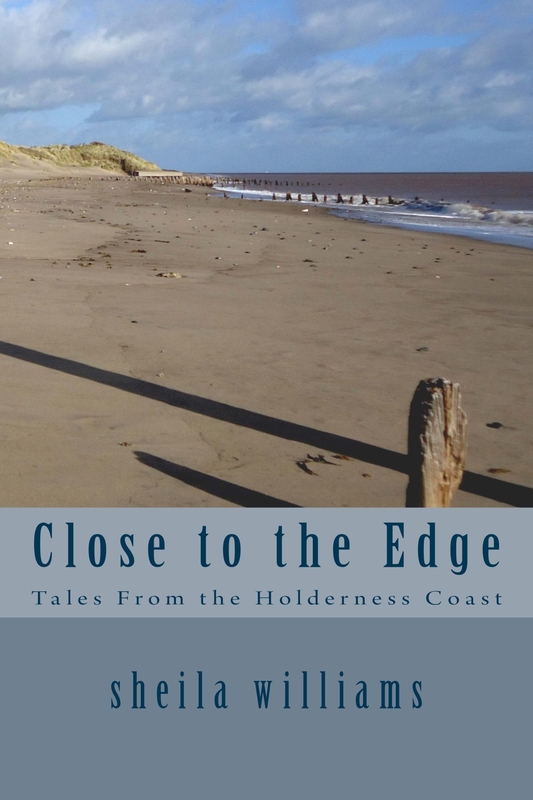 I incorporated the post – Ravenser Odd – The Town Under the Sea into my local history book – Close to the Edge: Tales from the Holderness Coast. It has proved to be one of my most popular posts. Whilst theoretically I understand how quickly and how far the press can spread the word, when it comes to spreading some of my words, it’s quite breathtaking. I hope all those who came to read the post had a good snuffle around the site. As a bonus, sales of the book have suddenly shot up too.Lovely start to the year. This blog will be reporting me for neglect before too long but I assure you I’ve not flown off on my broomstick to pastures new and green. However, I do feel like I’m in limbo land at the moment. After the build up to launching The Siren and Other Strange Tales; – all the editing, formatting, checking and double checking – once it was over I felt rather flat and a bit lost. Somehow through it all this Blog got put to one side. Following on from The Siren’s launch I drafted a plan for loosing my first novel ‘The Weave’ into the world. I had approached a few agents, more in hope than expectation, all of whom said thanks but no thanks. Then I had one more try and the synopsis and first three chapters duly landed on the agent’s desk. I forgot about it until I got an email asking to see the whole mss. I sat looking at the email, my mouth so far agape I began to drool on the keyboard. Now this might not seem like much but for me who has never had a foot over the threshold of trad. publishing, it seemed like a huge step forward. But then the spanner hit the works. Do I go ahead with my own publishing plan anyway? Do I commission the cover? Do I send review copies out? What if (wild imagining here) the agent wants to represent me, everything will change, won’t it? And at that point, just as my ancient PC does when I give it too much to consider and organise, I froze; hung up; went into stasis and will not unfreeze I suspect until I have a reply from the agent. In an effort to break loose I began book number 2 set in the 13th century. I got about a quarter way through the first draft and then lost the plot…literally. I am back to my old nemesis – I know what the beginning and the ending are going to be like but what happens in between…??? I may have mentioned it in earlier posts I have a disc full of novel sandwiches without their filling. I am determined that this one will not join them and have decided to take a break from it for a wee while. Instead I am researching and pitching some magazine articles just for a change of scene. So there’s a quick update for those of you wondering whether I’m away travelling on my time machine. I would say watch this space but I won’t because it may only be a blank screen. Oh and did I mention that I’ve quit smoking, the cartilage in my right knee has gone awol so I need a new knee and I’ve acquired a gorgeous seven-month old Alsatian/Husky dog called Petra? I am pleased and honoured to have been asked to contribute to the lovely Helen Hollick’s Tuesday Talk on her blog. If there’s anything you want to know about Arthurian England or Pirates, Helen is the lady to ask. She is the author of King Arthur: The Pendragon’s Banner Trilogy, The Sea Witch Voyages Series and more recently Amberley Press have published her non-fiction book The Truth and the Tales – Pirates. She is also incredibly brave and generous in letting a complete unknown loose on her blog. Follow the link to read what yours truly had to say about the rumblings of an embryonic writing career. Those of you who are kind enough to follow this blog may remember that a couple of weeks back I held my own referendum…er straw poll about the title of my collection of short stories. The winner was “Spook Me Out”. I was not happy with the result. I protested. I argued that the demographics of the poll were skewed (as were the participants after copious amounts of the juice of the grape). I pointed it that it was a meaningless collection of words and that titles need impact. In short, I wanted a recount. Do you judge a book by its cover? Those who are said to know about these things say yes, the cover and the title are a big part of the decision to buy or not to buy. I tend to look at the blurb on the back but it is usually an intriguing title that catches my eye and preferably one that gives me an idea of the genre as well. Quite often the cover design leaves me cold. I’m never moved by the piccys of impossibly handsome muscle men with fine etched six-packs and thighs like tree trunks, wielding their swords with gusto. Well, not on a book cover anyway! Have you guessed by now that fantasy is one of my favourite genres? Now let’s be serious. A few days after the results of my poll were in some of the participants sidled up to me murmuring that er…perhaps they’d got it wrong; they didn’t like the title any more and perhaps a rethink might be in order. Much heartened by this chink in the voters’ armour I rethought. It is, after all my book. I have created and disposed of the characters within. Their fate is and has always been in my hands. Is this not the annual occasion when I assert myself? Yes, it is. I was going to use the word ‘ghostly’ rather than’ strange’. Unfortunately the typeface I’ve chosen makes it look, at a quick scan, a bit too much like ‘ghastly’. I shied away from it. The reader might find the stories ghastly but my amour-propre won’t allow it. Publishing day is now 8th May in the Kindle Store on Amazon and if any of you dear readers feel impelled to give the book a toot on your own social networks I shall be Uriah Heep-ish in my ‘umbleness and gratitude. The editing of my collection of short stories is now complete and to celebrate I had a little Oscar Ceremony. There were three categories. Are you ready for this? Here is category number one. This simple word appeared it its various verb and noun forms a magnificent 100 times in the twenty five thousand word collection. Brilliant! “Then” is of course an old friend of the Editorial Oscars and it is reassuring to see its appearance in this collection. An objection made by “Just” on the grounds that it wasn’t fair was overruled. The judges chose this title for its modern, fresh feel and, as one voter expressed it – “gets away from all that gloomy Victorian stuff“. The author’s protest of “but I like gloomy Victorian” was met with uncalled for mirth and an unprecedented amount of catcalls and jeering. Needless to say, she was overruled. I don’t know what you think. Does “Spook Me Out” do it for you? Let me know. Drop me an Oscar…sorry, no I mean drop me a line. PS “Spook Me Out” (whatever!) will be on Amazon at the end of March at an incredible, unbelievable, once-in-a-lifetime little price.